Beautiful peacock eye sticks. These are iridescent green with blue and bronze colored "eyes." Excellent quality. We currently only have the 10-14" length. These have the full eyes but are only the upper portion of the quill. 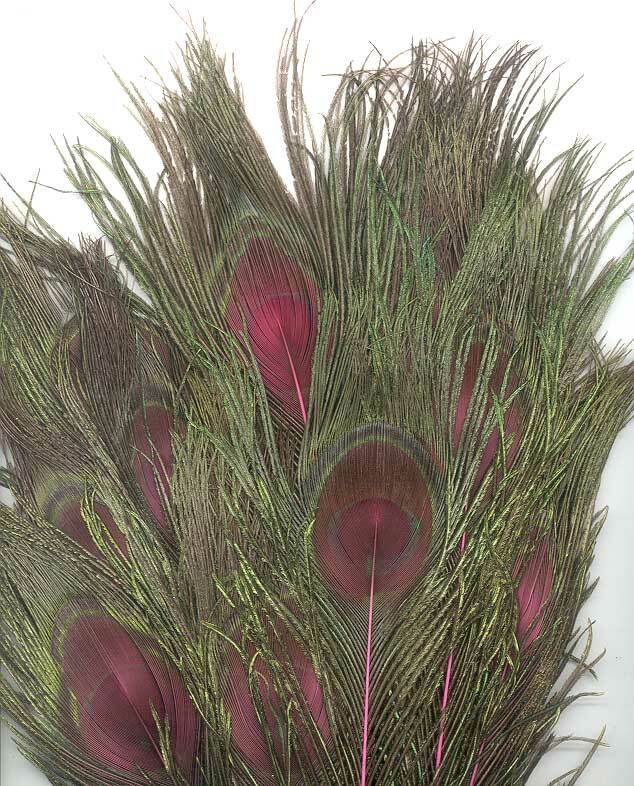 Peacock feathers may not be shipped outside the United States. 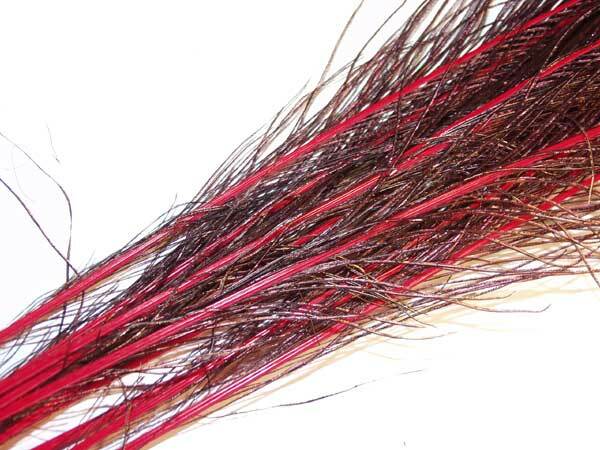 These are the side feathers from the tail and are generally called "swords." They are irridescent green with bronze and sometimes blue. The 14-16" size are just the tops and have been cut off. The 30-35" are the full feather with complete quill. NOTE: The 30-35" length feathers must ship separately from most other items due to size. Depending on what you order, you may incur a separate shipping charge for this item. If you order items too bulky to fit in a 4x4x48" box, we must ship your order in two parts. Beautiful peacock eye sticks that have been dyed pink. 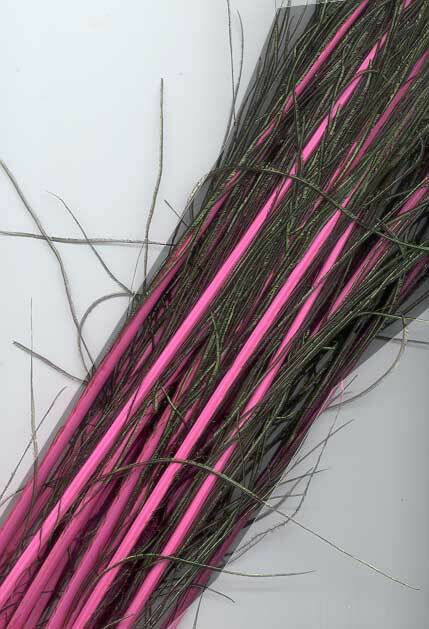 The front side still has a lot of the same coloration as the natural, but the back of the feather takes a deep pink as do the stems. The photo shows the back side. Excellent quality. 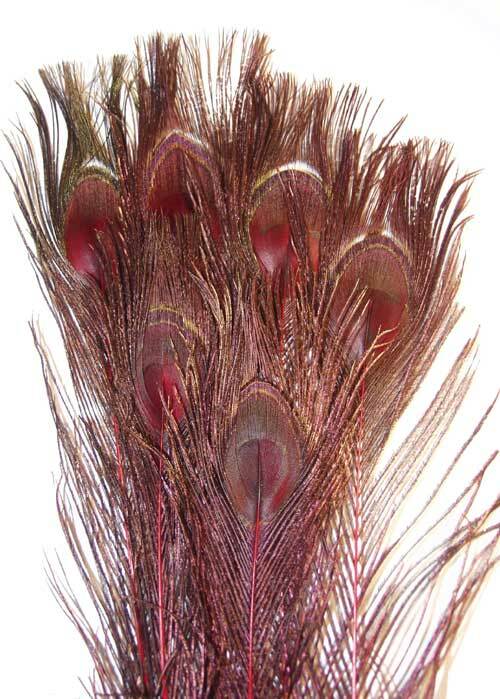 These feathers may ship separately from other items due to size and may incur a separate shipping charge. Beautiful peacock eye sticks that have been dyed red. The front side still has a lot of the same coloration as the natural, but the back of the feather takes a deep red as do the stems. The photo shows the back side. Excellent quality. 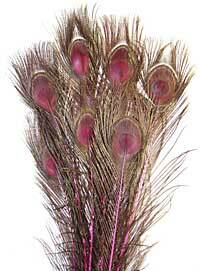 These feathers may ship separately from other items due to size and may incur a separate shipping charge.